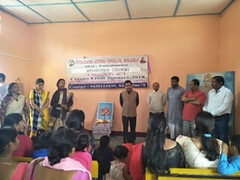 Vivekananda Kendra Arun Jyoti organized two Free Video Endoscopy Camps in association with Vivekananda Kendra Vidyalaya Alumni Association, Arunachal Pradesh at District Hospital, Roing and Community Health Centre, Namsai. The camp was started on 5th February and concluded on 9th February 2018. The Roing camp was for three days and rest two days was at Namsai. Dr. Vinayak Kulkarni, a renowned Gastroenterologist from Cincinnati, Ohio, USA voluntarily rendered his service for the cause. Ignited Youth Forum of Vivekananda Kendra, Kanyakumari, Paschimbanga Pranta in collaboration with Shri Shikshayatan School organized a 'Yuva Mahotsav' to commemorate the 150th birth anniversary of Sister Nivedita at Shri Shikshayatan School auditorium at Kolkata on 11th February, 2018 in a befitting manner. The youth inspiring program was presided over by Sri Nirmalya Bhattacharyya (Saha Sanchalak, Vivekananda Kendra, Paschimbanga Pranta). The function was attended by Sri Sajan Kumar Bansal (Managing Director, Skipper Group) as Chief Guest while Prof. Dhrubajyoti Chattopadhyay (Hon'ble Vice Chancellor, Amity University, Kolkata) and Smt. Bratati Bhattacharya (Secretary General Of Shri Shikshayatan Foundations) were present as special guests.